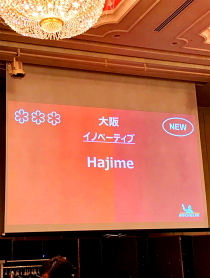 HAJIME was granted the highest rank of three stars in the Michelin Kyoto and Osaka issued in 2018. It is your support that has realized this result. We would like to express our sincere gratitude for all of you. As a result of increasing the number of stars, we would like to work even harder with all of the HAJIME staffs and make all the guests, agents, producers, Osaka, Japan and world shine. We would appreciate your continued support. Thank you!